NEWPORT, R.I. (June 29, 2016) – Brokers and managers, captains and crews, sponsors and exhibitors – it’s hard to say who got more out of the Newport Charter Yacht Show presented by Helly Hansen. The only one of its kind in the U.S., the trade-only show was staged over June 21-24 by new owner Newport Shipyard at its well-appointed 10-acre facility on the Newport waterfront. The show hosted a final total of 24 luxury charter yachts (10 sailing and 14 power), ranging from the 53-foot (16m) sailing vessel Contingency, presented by Nicholson Yachts, to the 161-foot (49m) motor yacht Zoom, Zoom, Zoom, presented by Northrop & Johnson. 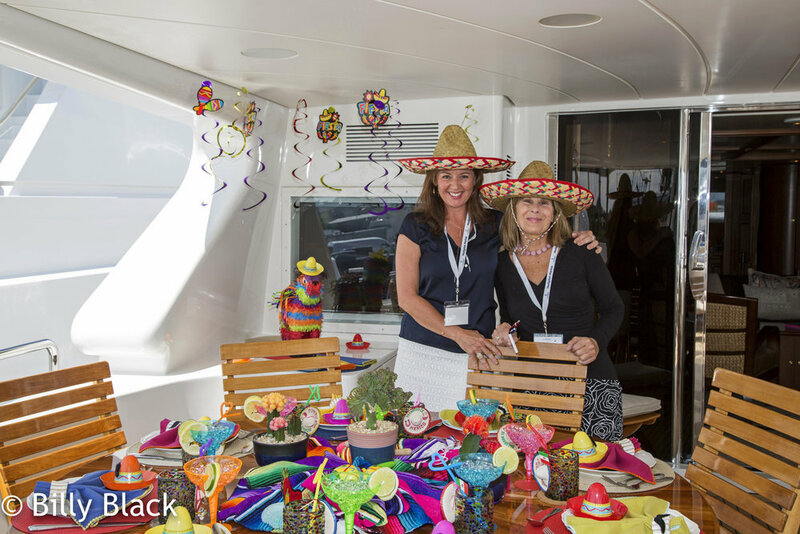 presented by Helly Hansen with its Mexican-themed participation in the yacht hop and Tablescaping contest, which it won. By all accounts, the show’s flow, both in layout and schedule, worked brilliantly to facilitate the serious business of luxury chartering while allowing plenty of time and room for networking and socializing as well as participation in an educational presentation for industry representatives and some friendly contests for crew. Bank Rhode Island sponsored a daily breakfast for show participants, while Hodgdon Yacht Services sponsored credential lanyards. The show tent used for Monday’s opening party – sponsored by Engineered Marine Coatings, Sea Hawk Paints, Providence Jet Center and Sentinel Limousine, with beer and wine sponsored by Bridge Liquors – also provided a staging area for Tuesday’s Best Charter Yacht Chef Competition, sponsored by ISS GMT and Port Supply; Thursday morning’s American Yacht Charter Association Seminar; and Thursday evening’s dinner party, sponsored byWard’s Marine Electric and featuring awards for the four different culinary competitions as well as music by Will Evans. Tuesday afternoon and Wednesday evening, respectively, were reserved for a Captain’s Drone Challenge, sponsored byCloud City Drones, and the traditional yacht hop where captains and crews entertained brokers, agents and sponsors using particular themes for coordination of colorful costumes, music, specialty cocktails and scrumptious hors d’oeuvres. Exhibiting vendors stretched from inside the tent to areas along each side of the checkerboard patio leading to Belle’s Café, a popular eatery at Newport Shipyard. Jay Lasky, owner of Helly Hansen in Newport, was happy with the foot traffic his elaborate “pop-up” merchandise store attracted. Visitors included crew members from the show’s charter yachts as well as other sailing and power yachts in the yard; patrons of Belle’s; and people simply stopping by the yard to take a peek at the yachts and activities taking place on its working waterfront. 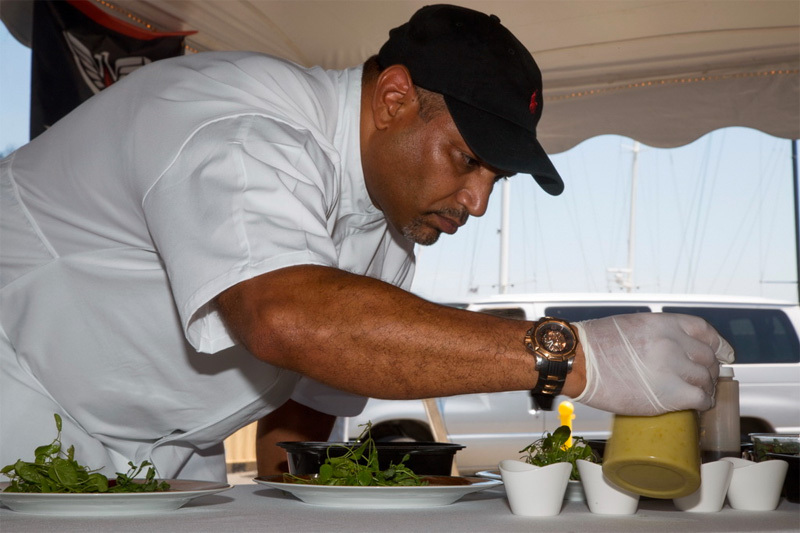 Chefs from six yachts competed for “Best Charter Yacht Chef” honors at the Newport Charter Yacht Show presented by Helly Hansen. 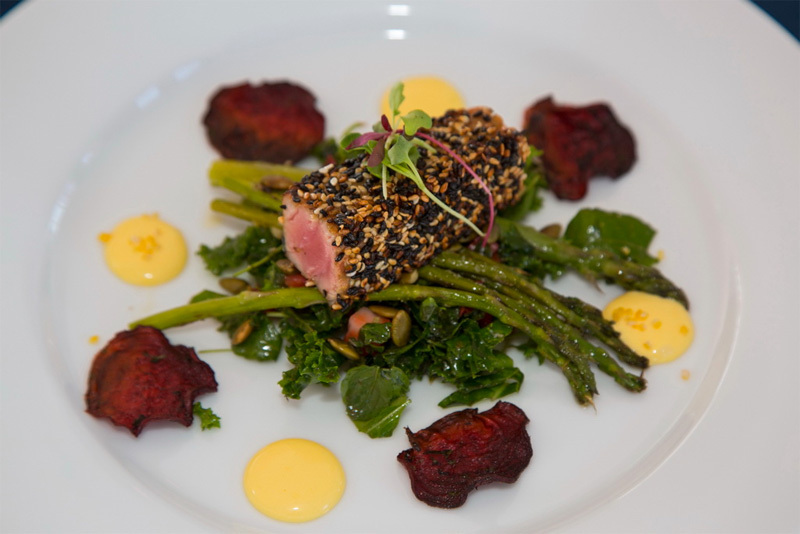 The show, held June 21-24 at Newport Shipyard, also included “Tablescaping”, “Healthy Beverage” and “Sunset Canapé” as categories in culinary-related competitions that gave chefs and crews on the show’s registered yachts a chance to shine, revealing not only their professional skills but also their personalities. Rosado was more than ecstatic when he learned he had won. From New York, he worked as a corporate chef for 25 years before taking his talents to the high seas, where he has been for the last three and a half years. He prepares three meals a day for six-to-seven crew members and another three meals for up to 10 charter guests as well as hors d’oeuvres throughout the day. Working from 5 a.m. to 11 p.m. for eight days straight, however, doesn’t seem to faze him. “The adrenaline you get when you win the lottery or get a big paycheck, that’s just like the rush I get when people enjoy my food,” he said. 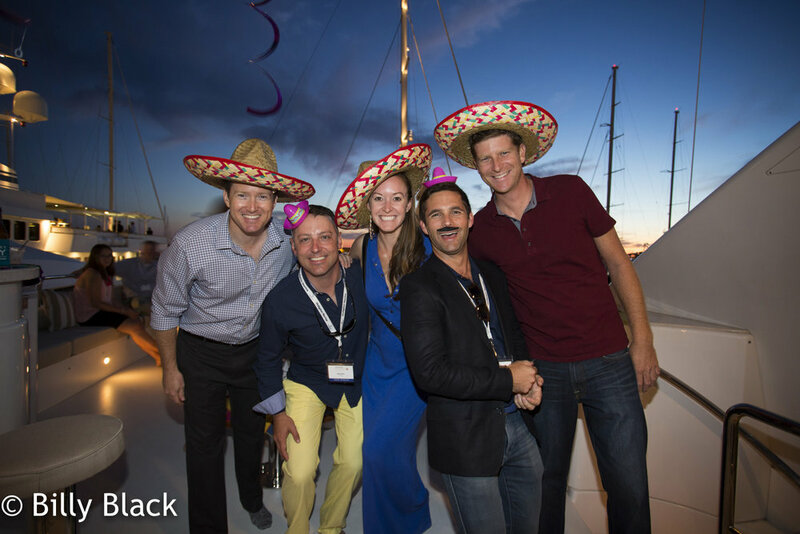 Adding to his elation was the fact that Siete also won both the fan favorite and the professionally judged divisions of the Tablescaping contest with a family-friendly Mexican fiesta theme that the crew also utilized during its “yacht hop” participation. 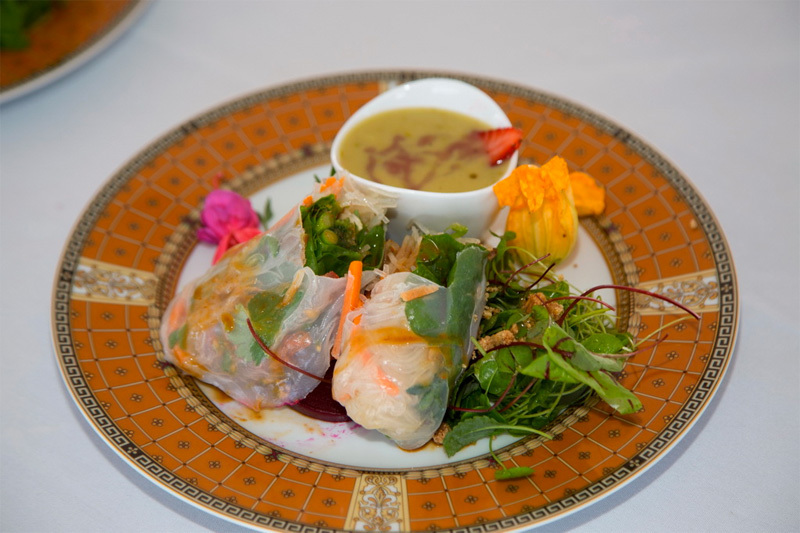 Winning the Sunset Canapé contest was Chef Linn Sagstad from the 65-foot (20m) sailing vessel Hurrah. Newport Shipyard, one of the most popular and recommended shipyards in the U.S., is a full-service marina and shipyard with over 3,500 linear feet of dock space that can accommodate yachts up to 300+ feet. Its amenities include a dockside café, ship store, fitness center, courtesy vehicles and crew housing. With its friendly staff, welcoming atmosphere and event planning capabilities, Newport Shipyard also is host to many other prestigious yachting events, including the biennial Newport to Bermuda Race Crew Party and the Candy Store Cup (formerly the Newport Bucket), an annual superyacht regatta to be held July 29-31, 2016. Click here for full list of attending yachts.